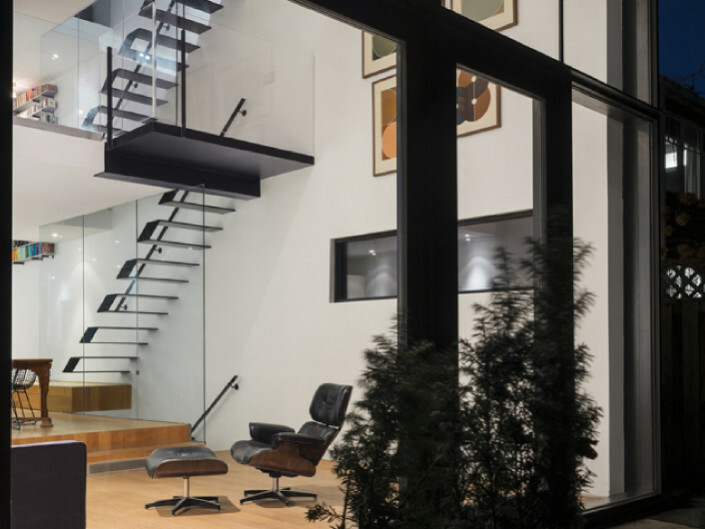 When Eric Yolles (son of renowned Canadian structural engineer Morden Yolles) wrote a program detailing every aspect of his new loft to be considered, he concluded with two words: “think penitentiary”. 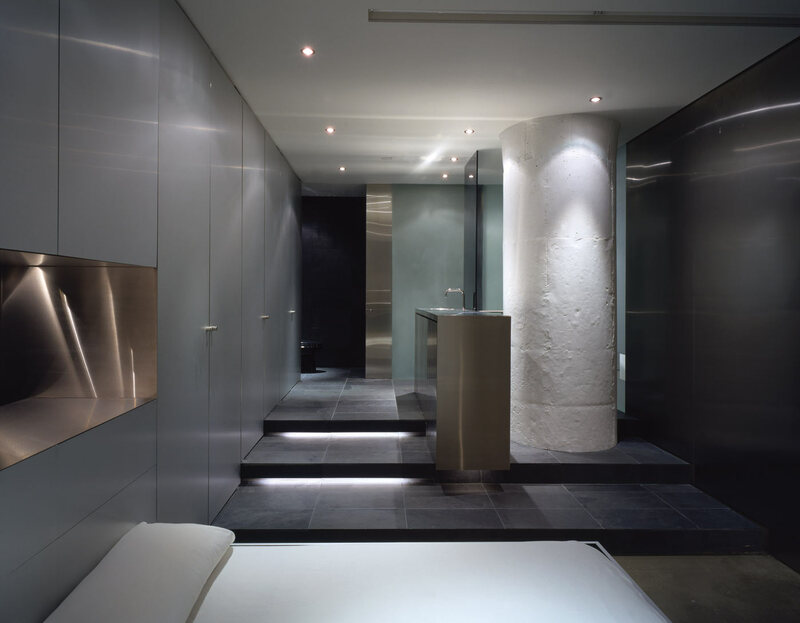 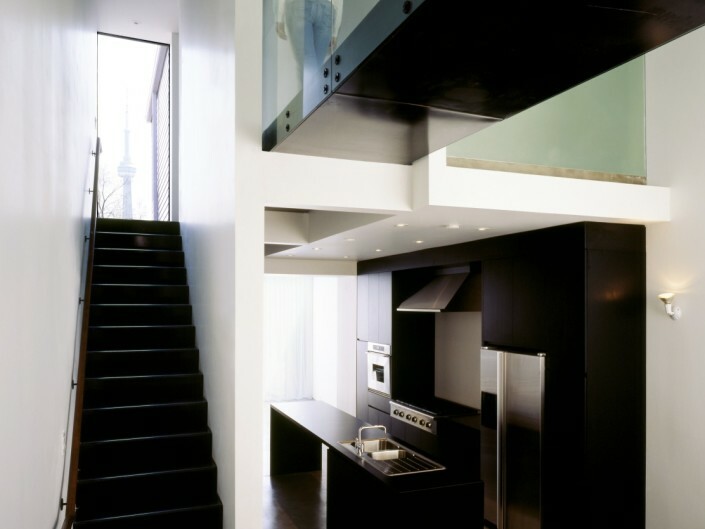 Not that Yolles wanted a home that would be cold and austere, rather the designers interpreted his words as a desire for a contemplative space with a minimum of spatial distraction; one with liberal use of specific materials restrained by sparing detail – that his loft would not contain any overt decorative embellishments or gratuitous design flourishes. 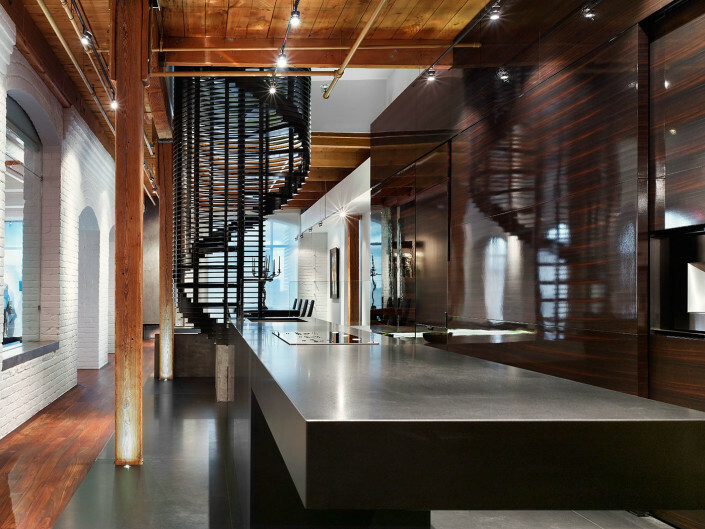 Housed in a converted warehouse in downtown Toronto, the 2,000SF loft is organized in a conventional strip with industrial windows at one end. 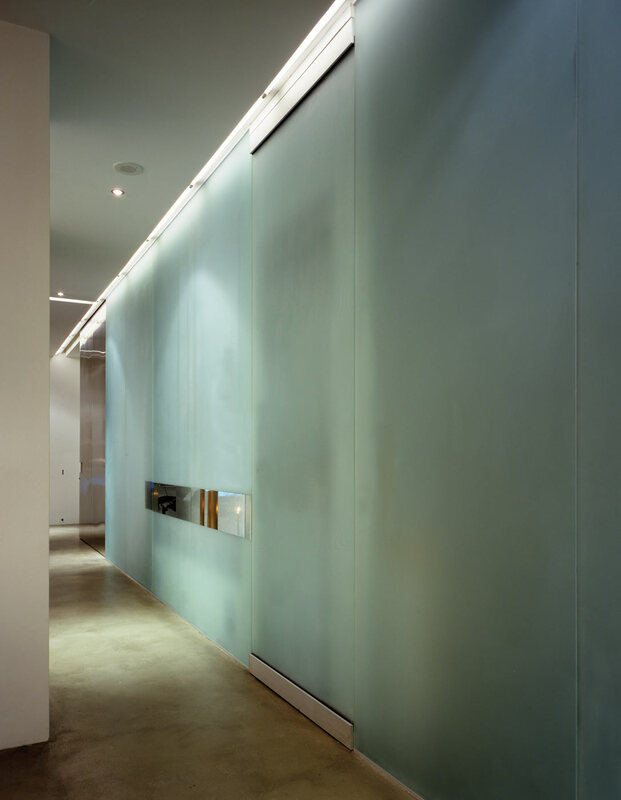 All non-structural walls were removed and a wall dividing the public and private areas was replaced with a 25’ sandblasted glass screen. 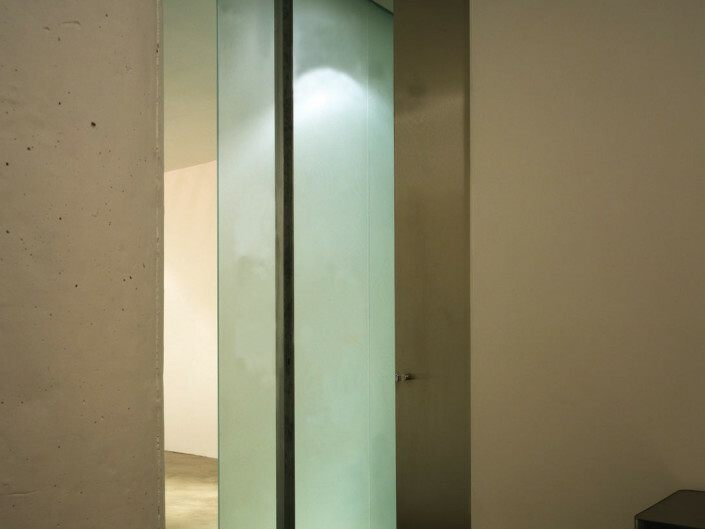 Layering with a sliding partitions of varying dimensions, views through rooms change as these panels move and entice with sections of clear and translucent glass – transforming and revealing one area as they conceal another. 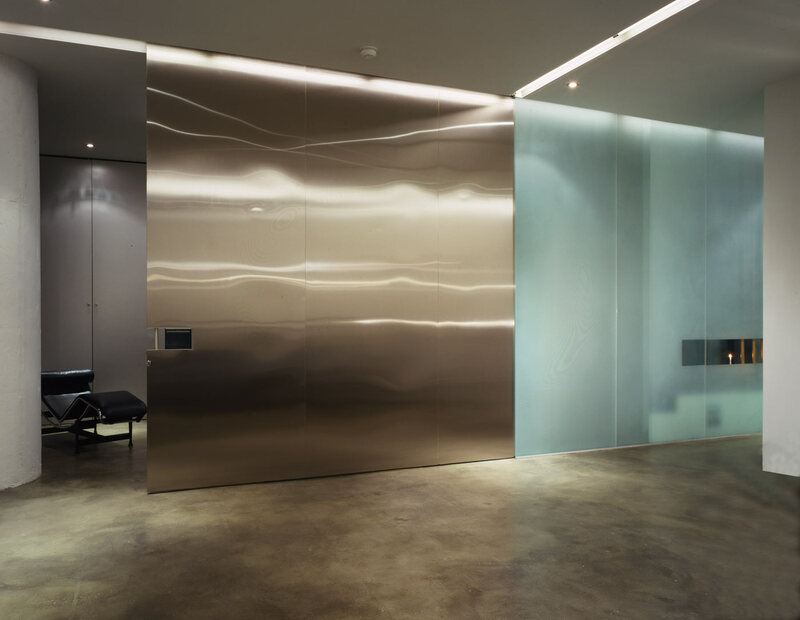 The largest of these partitions – a dramatic section of 15’ stainless steel – separates the bedroom/bath from the living room. 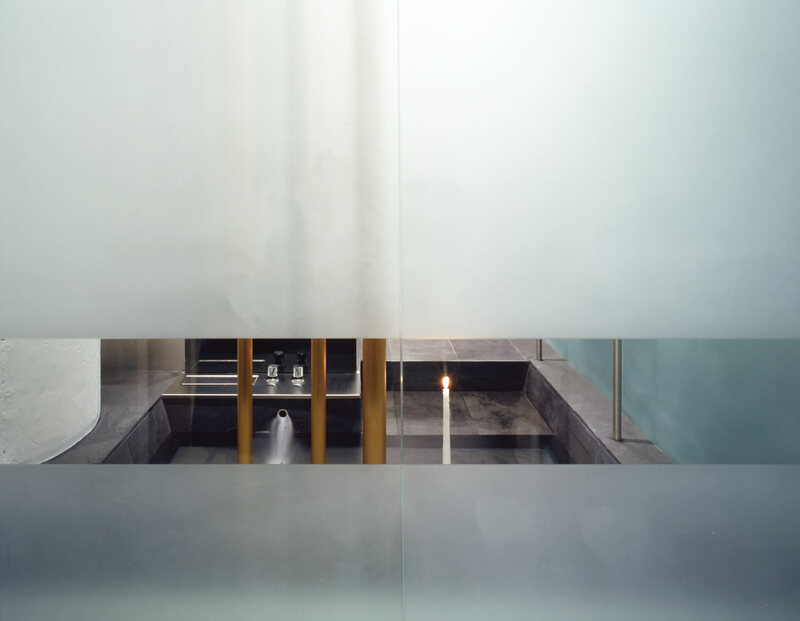 built-in candleholders. Experimenting with the act of viewing, the bathing area is like a stage set where one enacts the self-conscious performance of both watching and being watched. 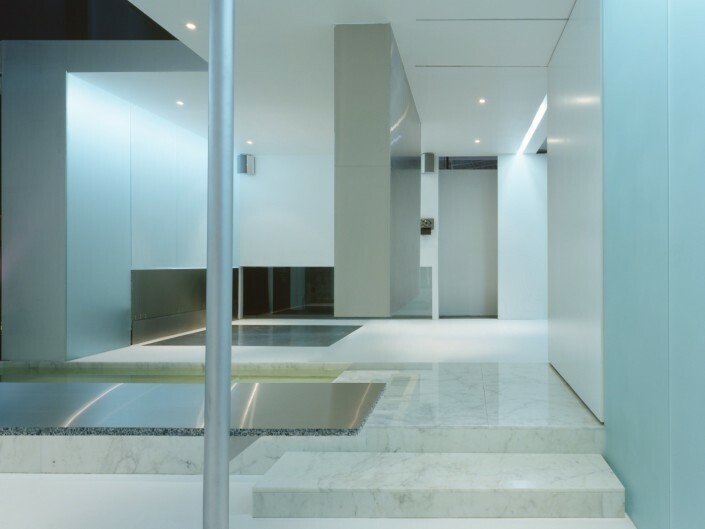 Designing everything essential to living directly into the space is an integral part of the designer’s creative philosophy; creating ‘a narrative of habitation’ – or composing a ‘script’ for the client. 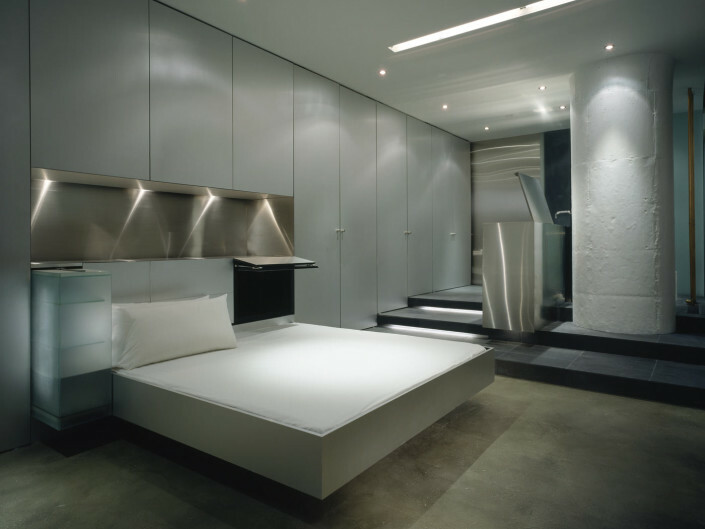 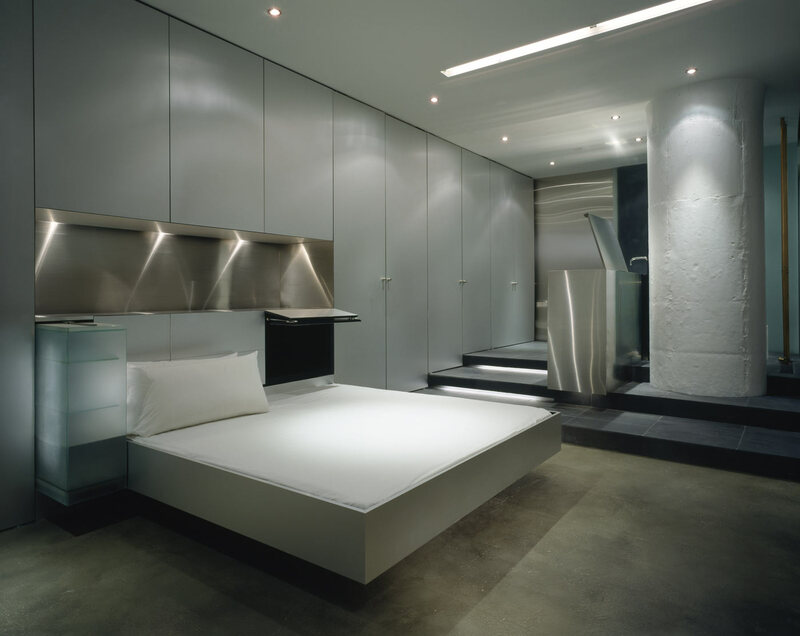 The bed (aluminum-clad and king-sized) is cantilevered from the wall so that it appears to hover in mid-air. 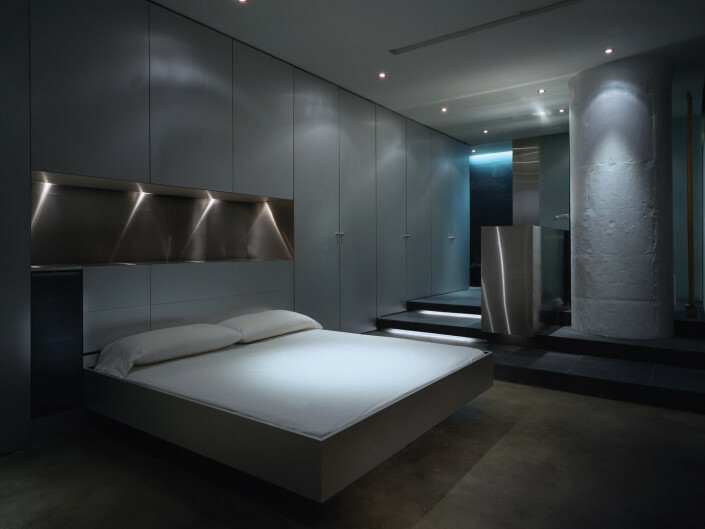 A glowing bedside ‘command module’ constructed of acid-etched glass slides open to access light switches, thermostat, telephone and fan. 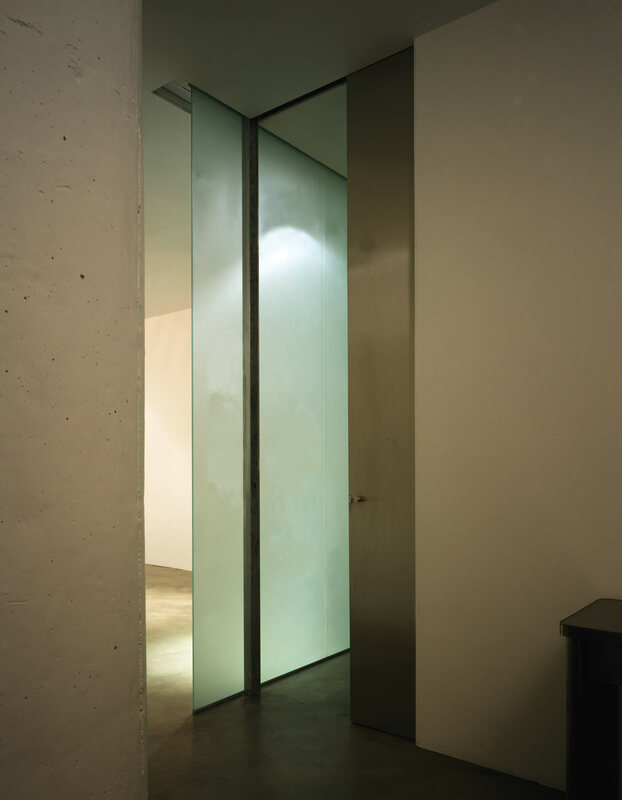 Aluminum floor-to-ceiling doors concealing storage closets span the entire length of bedroom and bathing areas, functioning as a backdrop the activities and elements within. 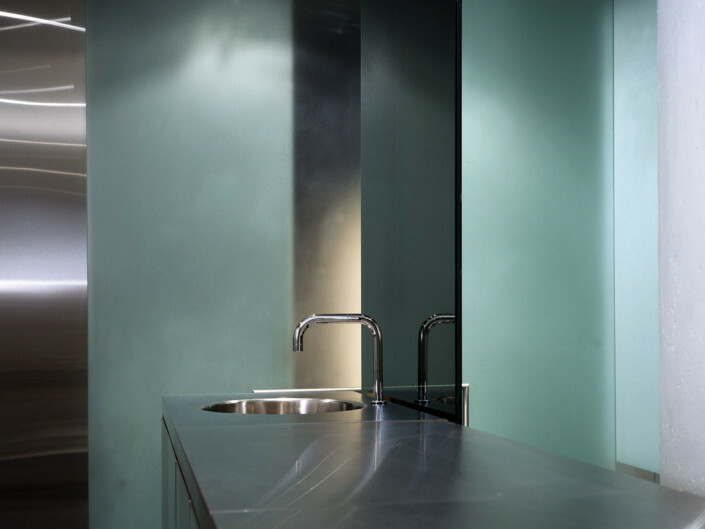 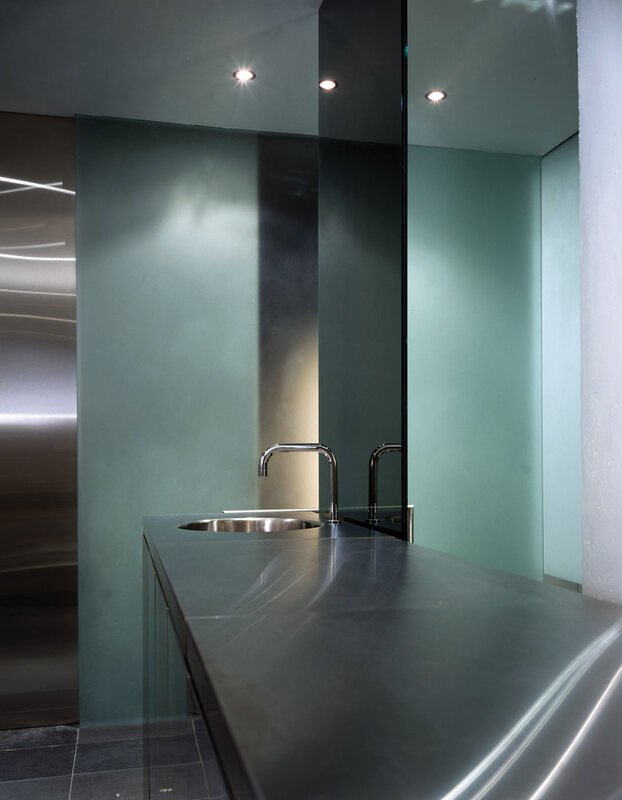 Though bare and elemental, the liberal use of glass, aluminum, stainless steel and slate impart an unexpected glow and warmth to the interior, specific to the materials themselves. 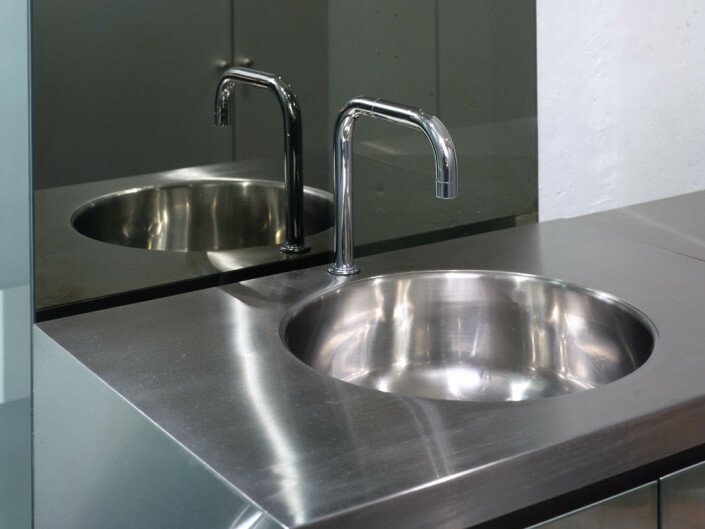 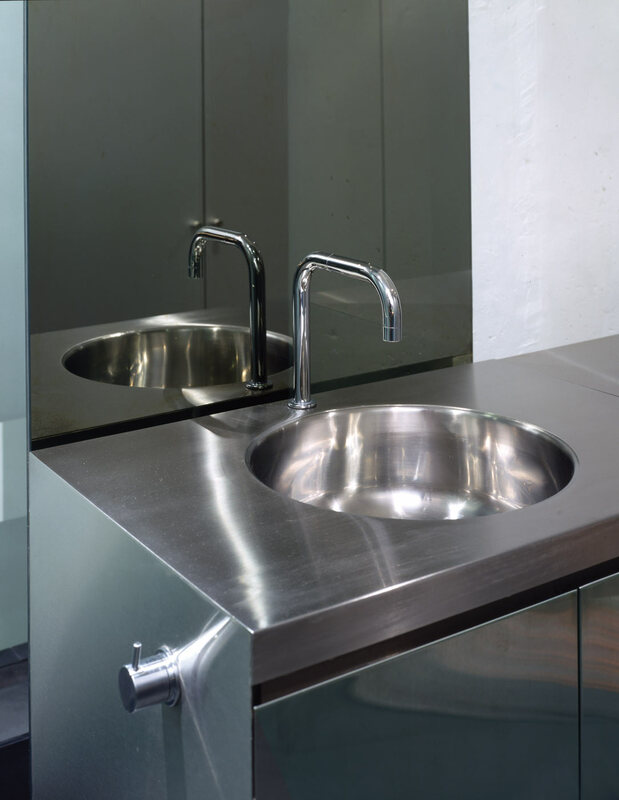 Subtle nuances and reflections in the aluminum and stainless steel reveal themselves through lighting, playing off surfaces, lending a sculptural, ephemeral quality to the bed and freestanding vanity. 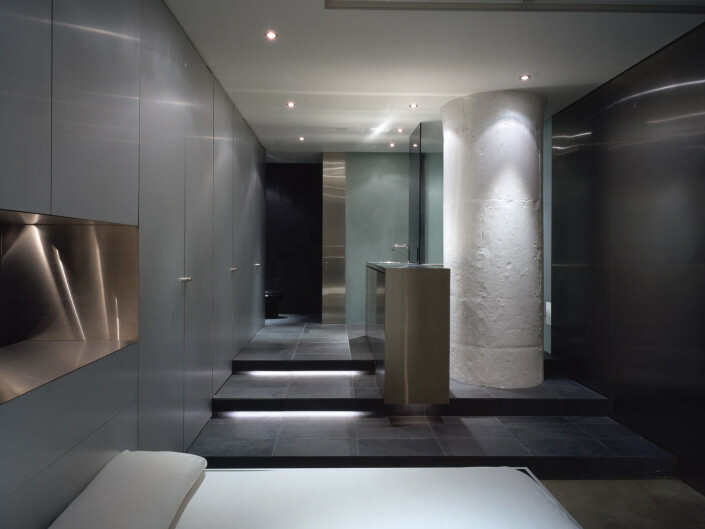 Using light as a theatrical element, halogen and fluorescent fixtures are used in a variety of combinations to re-define space, use, and atmosphere. 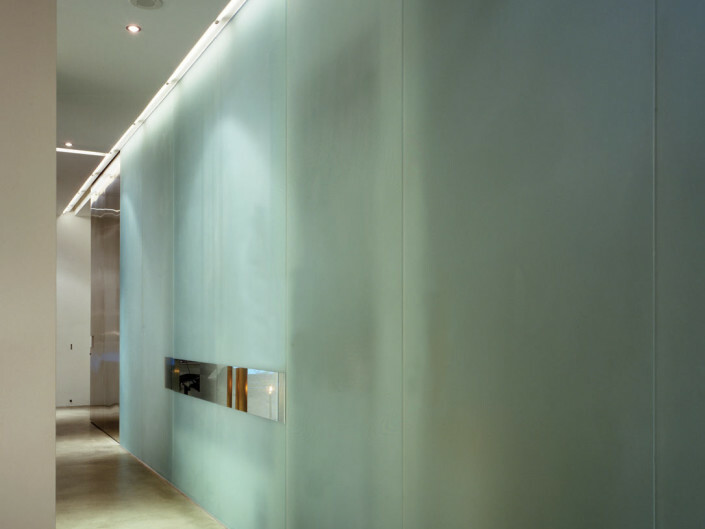 Intersecting ceiling-mounted recessed fluorescent lighting provides general ambient lighting while halogen and accent lighting are strategically positioned to subtly highlight existing and new details and textures.